Today’s Johannesburg Memorial for Nelson Mandela has been the culmination of the last few days of presidents, prime ministers, former world leaders and the inevitable celebrities providing commentary and reflections on the freedom fighter and former president of South Africa. One of the first commentators I heard from was former president of the nation (and Nobel Peace Prize winner–jointly with Mandela) F.W. de Klerk. His comments about that crucial period when the transition to democracy fell upon Mandela’s shoulders and its difficulties have been mostly what one would expect, but I was surprised to hear from him before Mandela’s immediate successor President Mbeki. 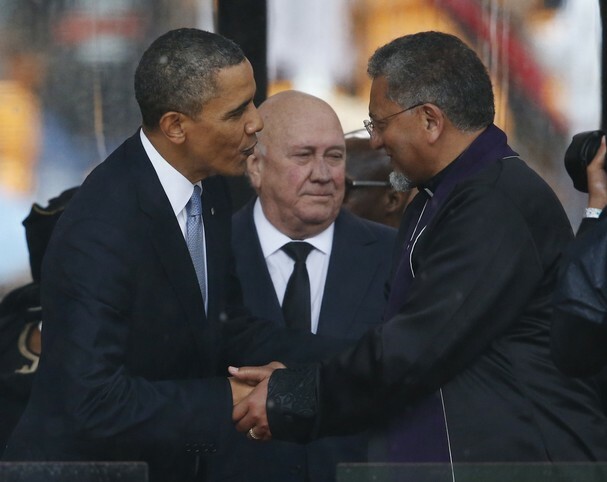 Obama and de Klerk greet Methodist Bishop Ivan Abrahams at Mandela’s Memorial today. However, one thing that really struck me is how virtually every news outlet: CNN, SABC, BBC made no hesitation to refer to him as “former president de Klerk”…occasionally even using the honorary title of “president” when asking him a question. This included interviews in the South African press. Think about it. Certain news outlets and commentators can barely stand to call Obama “President Obama” when he won with a clear, fair majority. Yet who is F. W. de Klerk? A leader duly elected in 1989 in a nation where less than 20% of the population–the white population plus a few others–were allowed the franchise. He didn’t even win that minority by a landslide, either, but with a healthy margin to be sure. So, at best, around 12% of the adult population of South Africa had cast a ballot for de Klerk and his party. If ever there was a situation where the current media could justify ditching formalities it would be the case of an apartheid-era president of South Africa: a regime/era that has long been internationally discredited. And yet, they haven’t. There have been the asides from commentators and presenters referring to him as “South Africa’s last white president” or even “South Africa’s last minority-rule president”, yet making a point to respectfully refer to the man as “president de Klerk” or “former president de Klerk”. I am not disagreeing with this, but rather whole-heartedly supporting it. It goes to show the wisdom of Mandela in not completely dismantling the old framework as has happened in other transitions. Yet the last few years in the USA there have been sitting congressmen who see fit to shout out and interupt a State of the Union address mid-speech. The 2012 picture below of the president with Arizona governor Jan Brewer came to mind in sharp contrast with the respect I’ve seen shown de Klerk the last few days. Can anyone provide me a photo of another incident of an American governor doing the same with his/her president? No matter how much they disagree? I am not saying it hasn’t happened before, I just have yet to see a photograph of Johnson, Nixon or Reagan being lectured this openly or crassly. If one exists I’d be much obliged to see it. The American system has hit a level of crass and open disrespect for the office I would argue we haven’t seen since the middle of the 19th century. Some of it did begin under President Clinton, and amplified under Bush. President Bush did not win a nation-wide majority vote in 2000. However, he was the rightful president in accordance with system and, as a whole, other politicians and journalists were deferential to the office (if not all folks at the grassroots level). Another example I would bring up is President Gerald Ford. Remember, upon his swearing-in on August 9th, 1974 not a single American had ever voted for him as president OR vice-president. He was selected by Nixon during his second term as a replacement for VP Spiro Agnew in the light of financial controversies. Yet Ford was given the respect and deference by other political figures, governors, and the media that any majority-elected president would have received. Obama decisively won in 2008 with a larger majority–and a larger % of the white vote–than Clinton did. No sane observer can claim first-term Clinton was treated as an illegitimate usurper in some quarters the same way Obama was in his. If black South Africans who grew up under the yoke of Apartheid can give former president de Klerk the respect traditionally accorded the office I should think the likes of Justice Alito or Rep. Joe Wilson could handle doing the same in this country.